If you’re about to begin the hunt for your wedding ring and you’ve decided on a gold wedding ring, you’ll probably agree with me that it can be difficult to find useful and trustworthy information. Gold content, alloys, allergies, durability, design, weight, cost, width and especially ethics all matter when purchasing your gold wedding rings. And we know this can sometimes feel overwhelming. What’s great is that in this article you’ll get the real story on gold wedding bands and find all the information you need to help choose your perfect ring. Our Borderless Rope Wedding Band. View our Rope Collection here. The word, karat, is a variation of the word, carat, which originated in Greek-Roman cultures and is actually related to carob seeds, which are incredibly uniform in weight. Carat is used in the measurement of precious stones. Karat references the percentage of gold in wedding rings or jewelry. Twenty-four karat gold (24K) is pure gold, or .9999% gold. 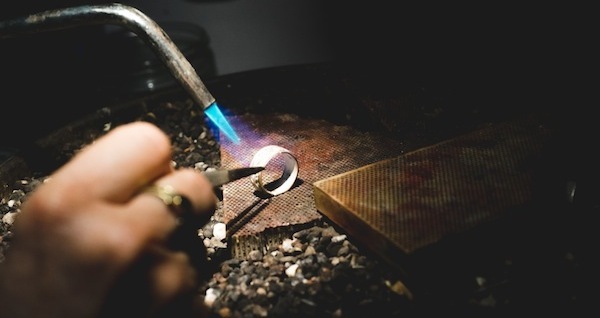 Alloys are mixed with 24K gold in the manufacturing process of 14K and 18K gold wedding rings. 2. 18 Karat Gold Wedding Rings vs. 14 Karat Gold Wedding Rings. An 18K gold wedding band is 75% pure gold. A 14K gold wedding band is 58.5% percent pure gold. Without alloy, gold has an Mohs hardness of 2.5, which is actually about as soft as a fingernail. 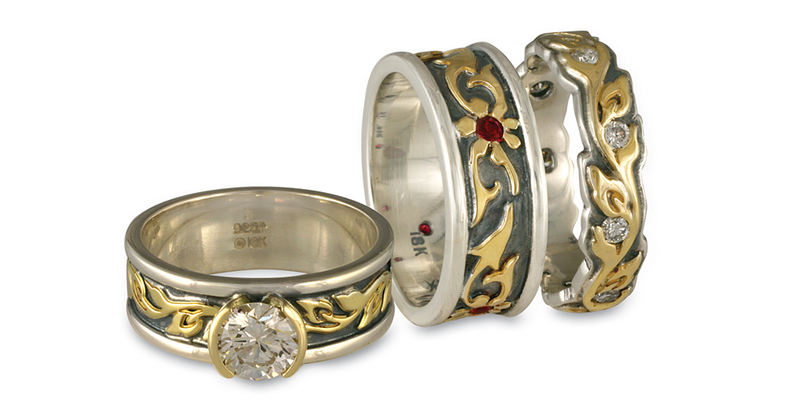 Alloys are mixed in with gold to color the gold and make gold wedding rings stronger. 3. Advantages of an 18K Gold Wedding Ring. Compared to a 14K gold wedding ring, an 18K gold wedding ring’s most important feature is its higher gold content. With more gold, the ring is actually softer, richer and has more caché. “Fine jewelry,” for example, translates to 18K gold. In contemporary parlance, gold means value, prestige, and achievement. Most importantly, many people feel an18K gold ring is more beautiful than a 14K gold ring. With 75% gold, the color has a deeper radiant beauty. 4. Advantages of a 14K Yellow Gold Ring. The first advantage of a 14K gold wedding ring over an 18K gold ring is that it is more hardwearing. 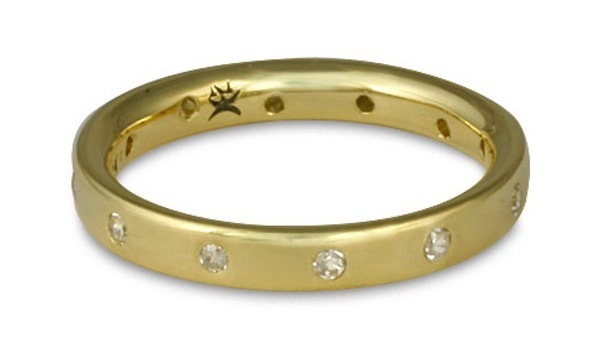 The second advantage of 14k gold wedding bands is that they will be less costly than the equivalent 18K gold ring. If price is of little concern for you and you don't usually engage in too many abrasive activities with your hands, we strongly recommend 18K yellow. It will have a more vibrant golden color than 14K. 5. What are Alloys & How do They Make a Ring 14K or 18K Gold? 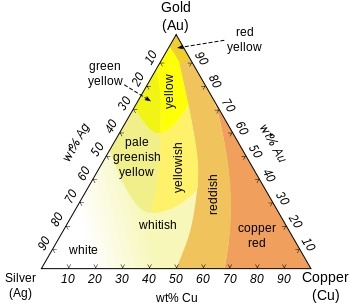 The gold alloy chart above shows how metals such as copper and silver in various mixtures impact the color of the gold. But other alloys are used to increase properties in the gold for jewelry fabrication. 14K yellow gold is typically 58.5% gold, 31.2% copper, 6.3% zinc and 4% silver. 18K yellow gold is typically 16% silver and 9% copper. Certain gold supply houses have their own proprietary mixture to create colors unique to their particular brands. 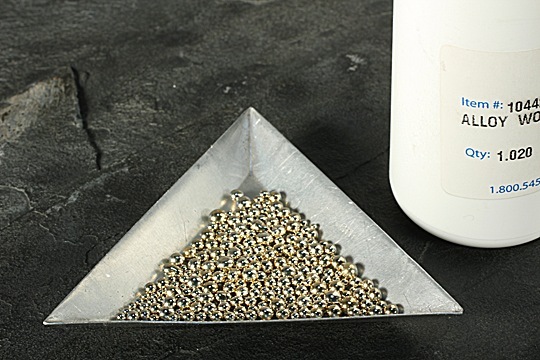 Other metals used for alloying white gold include nickel, palladium, and platinum. 6. Allergic Reactions to Gold Wedding Rings. People are not allergic to gold itself. In this regard, it is a relatively human-friendly metal. However, some people are allergic to alloys used in gold wedding rings. While very occasionally people do have allergic reactions to white gold wedding rings alloyed with nickel, reactions to yellow gold wedding rings are extremely rare. However, you can still get skin a irritation from wearing gold wedding bands—or any ring for that matter. 7. Rashes Due to Wedding Rings. Skin irritation can occur when wedding rings fit too tightly. Gold wedding bands with diamonds or any gemstones can also cause rashes due to bacteria that can multiply in the small nooks and fractures between the fingers and gems. Here’s a bit of advice if this happens to you: upsize the ring if necessary and keep your fingers and ring clear of dirt or debris. The problems of skin irritations can usually be resolved by allowing time for your skin to breathe and heal. A comprehensive medical blog on ring allergies can be found here. Our Simplicity Wedding Ring with Gems. View our Classic Comfort Fit Collection here. 8. Heaviness of a Gold Wedding Ring. Heaviness has to do with the density of the metal in a ring. The denser the metal, the heavier the ring. 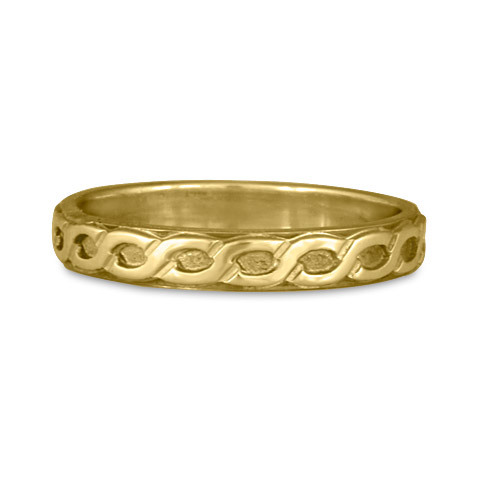 The density of gold in wedding bands is going to vary slightly according to alloys used. 9. Metal Feel and Tone of Your Gold Wedding Ring. Why do people choose yellow and white gold over other metals? Even white gold is chosen over the natural white metals of palladium and platinum—and perhaps this has to do with humanity's ancient attraction to gold. Gold is the foundation of modern capitalism, and the alchemist's dream. Gold never tarnishes. It represents wisdom, radiance, and the warm rays of the sun. Our polishing room at Reflective Jewelry. 10. Basic Cleaning and Common Scratches. Gold wedding bands are very easy to clean, simply because gold does not tarnish. For a basic cleaning, rub a jewelry polishing cloth vigorously on the surface of the ring. To remove scratches, you’ll need to take the ring to a jeweler. Depending upon the design elements, after taking the ring to a polishing wheel, it can look as good as new. 11. Cleaning Accent Gemstones in Rings. It’s common that after a time your accent gemstones will start to loose their sparkle. This can happen so gradually that you may not even notice it. Many jewelers have hydro-sonic cleaners that remove our body oils and dirt from gems to bring gold wedding bands with diamonds or gems back to their original state of shine. In most jewelry manufacturing these days, particularly for large companies, gold wedding rings start with computer-rendered CAD/CAM files—from which molds are then created by a modeling machine. Simple gold wedding bands are also dye-struck, and basically punched out of metal like pots and pans commonly are. Outside of setting gemstones, if there’s little or no hard work then there’s not a lot of handwork. So, here’s our editorial comment: we think machine-made mass-produced wedding bands are not the best symbol to wear for your love and marriage, which is unique to you and you alone. There are still jewelers who are highly skilled wax carvers, creating models by hand which are then cast out using the traditional lost wax casting. An excellent example of this one of our own, Michelangelo Stanchi. He learned his wax carving craft passed down through generations of his family, in Italy. can be combined with silver. This type of work requires jewelers with many years of experience and skills. 14. Makers of Gold Wedding Rings. At our company, we pride ourselves as being artisans, part of the maker’s movement. 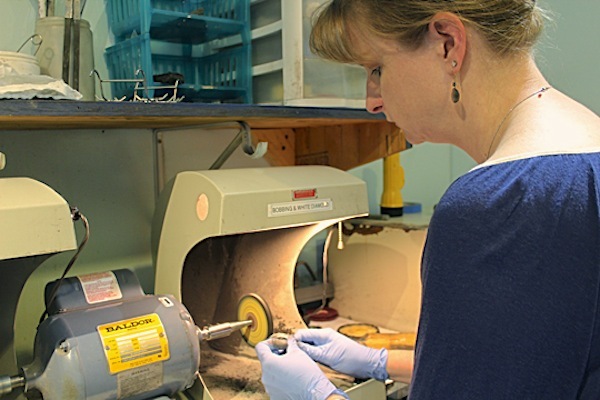 We work with metal wire and sheet metal to hand fabricate our gold wedding rings. 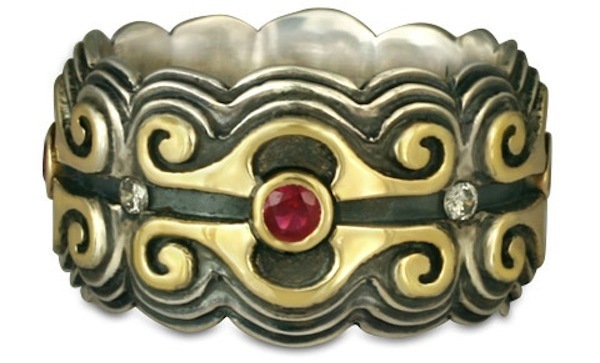 Our techniques are rooted in the American Southwest, where the metal-smithing tradition has been passed down from Spanish, Native, and Anglo jewelers. 15. Men’s Gold Wedding Bands vs. Women’s Gold Wedding Bands. Men’s wedding rings are generally wider than women’s wedding rings because men generally have larger hands. What we’ve found as jewelers over the past twenty plus years is that typically, mens wedding bands fall within 5mm to 8mm in width. Few men choose under 5mm, with the common exception of perhaps comfort fit wedding bands. Men do not typically wear both a wedding ring and an engagement ring together, let alone an engagement ring. However, with the emerging trend of mens engagement rings, this might become more of a common thought for men. 16. Wide or Narrow Gold Wedding Bands? Wearing one gold wedding ring instead of a two, like in bridal ring sets, gives certain beneficial options in context to design. A wider gold wedding band allows more space on the surface of the rings, which translates to more of a canvas for the jeweler to create a detailed design. With our Starry Night line of rings the design is more prominent when there is greater space between the borders of the ring. If you choose one of the more simple gold wedding bands with no design, how much surface area the ring, for design or motif, has is not so much of an issue. 17. How Wide are Women’s Gold Wedding Rings Generally? Gold wedding bands for women tend to be between 2mm and 5mm wide. Women generally have smaller hands then men and they usually wear their engagements rings with their wedding rings as a bridal ring set. Commonly, women prefer to have a combined width of two rings not beyond 8mm. So, more often than not womens wedding bands are no wider than 5mm. 18. 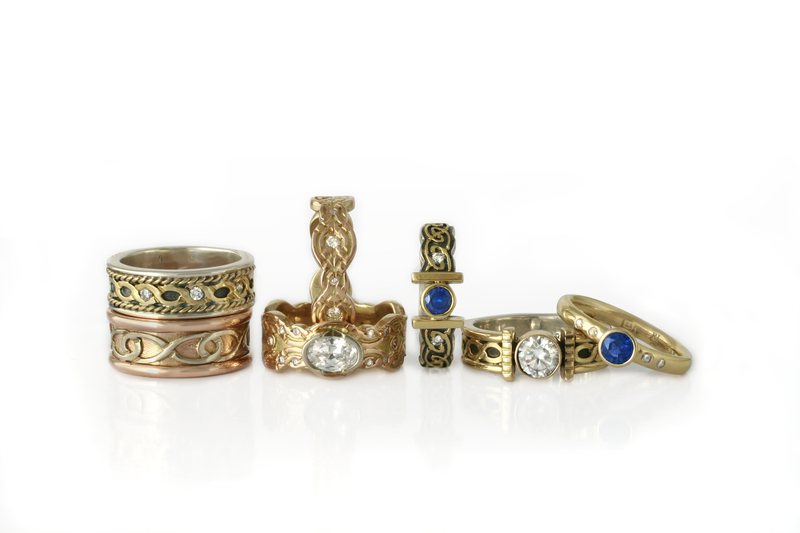 Gold Wedding Ring Sets: How Will They Fit Together? When considering gold engagement rings, take into consideration how your wedding band will fit alongside it. Some gold wedding bands are designed to fit smoothly with the engagement ring, as shown with our Garden Gate collection. The rings are more likely to stay together on the finger, depending, of course, upon the fit. While our Donegal Twin Bridal Ring Set will stay together only if the pieces are fixed together, as shown above. Having a design flip around on your finger can become a nuisance to some people. Ultimately, width, weight and design are all very subjective issues. It’s about what feels best to you. 19. To Match or Not to Match? For some couples, matching some element like design or shape is important to them. Others decide to match metal type and color, while some couples don’t worry about matching at all. It’s all highly personal and dependent upon what you and your partner feel most comfortable with. 20. How Thick Should Your Gold Wedding Band Be? Over the years, we occasionally are asked, particularly from website customers, how thick is your ring? Wedding rings should have a certain heft to them. Behind that question is, am I going to purchase a ring online that feels light and cheap? Although there is no specific standard, a medium thickness is generally in the 1.6mm to 1.8mm range; and heavy thickness is in the 2mm range, guaranteeing maximum durability over the years. Also, as shown with the ring above, that we make in our studio, the layered metal of the ring on the left makes it stronger, as do borders on some of our other rings. 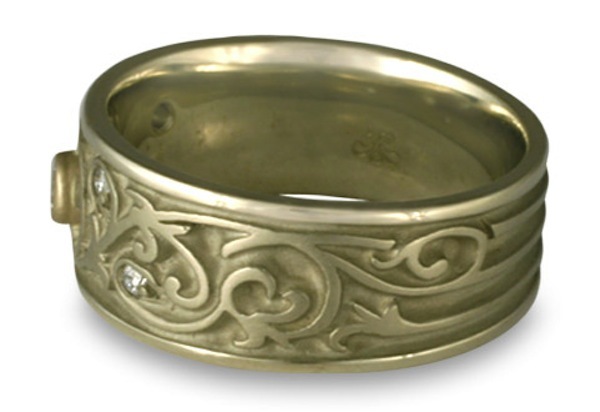 The sizing band in this ring is carefully designed into it so as to not interrupt the motif. 21. Any Gold Wedding Ring Can Be Resized. Resizing often involves cutting the ring to either add more metal or remove it. For slight stretching and shrinking this can be done swiftly and mechanically without any cutting of the ring. Simple gold wedding bands without diamonds or gems are easier to resize than those with them, but nonetheless can be resized, it just takes a different process. The small inset gemstones more often than not loosen during the resizing process and in some cases a new ring has to be made in order to obtain the desired size. A preventative solution to complicated resizings, and in order to have more flexibility, jewelers sometimes put sizing bands on the palm side of the ring. However, the disadvantage of the sizing band is that it interrupts the design pattern. If the ring turns on your finger, the sizing band shows instead of the desired motif, and can become a nuisance. 22. 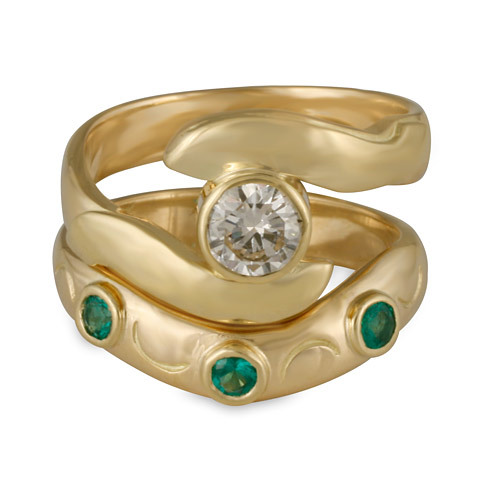 What Accent Gems are Suitable with Gold Wedding Rings? For wedding rings, diamonds are the best simply because they are the hardest, most durable, of all gems. Sapphires and rubies also are stunning, but are not as strong. Over the years due to natural wear and tear, these softer gems can be scratched and lose their sparkle. Nevertheless, we can set just about any gem that can be found in a wedding ring, as long as we can find the right size. Something helpful to keep in mind is that not all gems are available in sizes under 2mm, which is a commonly chosen size by jewelers for selecting accent gems. 23. Ethical Considerations in the Sourcing of Precious Metal and Gems for Your Gold Wedding Band. I think you’ll agree with me when I say that you wouldn’t want to wear a wedding ring, which symbolizes you and your partner’s love, made with gold that has destroyed communities and ecosystems. Yet, for the vast majority of people unfortunately, that is the norm. First, can your jeweler trace the sourcing and production of the gold wedding ring from the mine all the way through the process of production to your finger? Second, does the sourcing of your gold wedding band create benefit and prevent exploitation for the producer communities? These days, particularly in North America, recycled gemstones and metal are unfortunately considered the ethical choice. Yet, recycled metals and recycled gems do not increase or decrease the profit driven large-scale mining operations. Nor does the use of recycled create any advantage for people who are attempting to feed their families through their own resources in developing countries, such as small-scale miners. Our view is that jewelers should use recycled materials only when there are no options to support supply chains that create strong downstream economy in developing countries. Tanzanian miners, working with Ruby Fair, search for rubies. 24. What about Ethical Gemstones and Diamonds? People often choose to adorn their wedding rings with gemstones. Upwards of 70% of gemstones are supplied by small-scale miners around the world. Unlike diamonds, conflict gemstones are not so much of an issue. The reason is because the value of polished and cut diamonds are much more transactional and standardized on the international market than other gems. Ethical gemstone sourcing is based on the gems traceability and transparency back to the mine. We also need to consider the conditions at the mine, the cutting facility and the business practices of the supplier. Ideally, we would source our gems from a cooperative mining community that follows fair trade principles and standards, and is third party certified. The polishing of a gem from that mine would be based in the actual mining community, creating more downstream economy. Plus, there would be a premium generated from the sale of the gem, which would benefit the broader community development. Yet, only a few gemstone traders among the tens of thousands satisfy even a few aspects of the "ideal world" scenario; and these traders focus on only a few high range gems for wedding rings: specifically rubies and sapphires. As for diamonds, small diamonds that are traceable to source are difficult to come by. The next best choice are diamonds recycled from old rings. 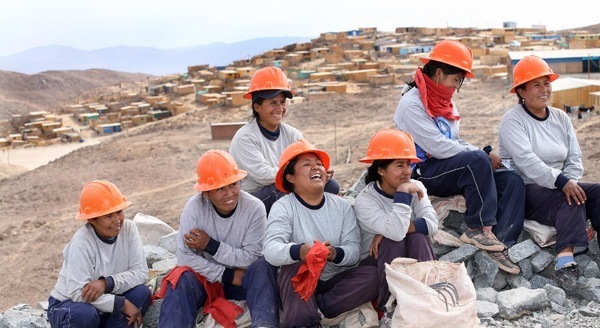 Miners from a Fairtrade gold mine in Peru. 25. Ethics of the Gold In Gold Wedding Rings. The most ethical gold to use in your wedding ring is fairtrade gold, which offers the best chance for small-scale miners to work their way out of exploitation and poverty. The Fairtrade gold certification is an independently audited set of benchmarks created by Fairtrade International. The commercial platform with its standards and principals connect retailers to miners through a transparent and traceable supply chain. 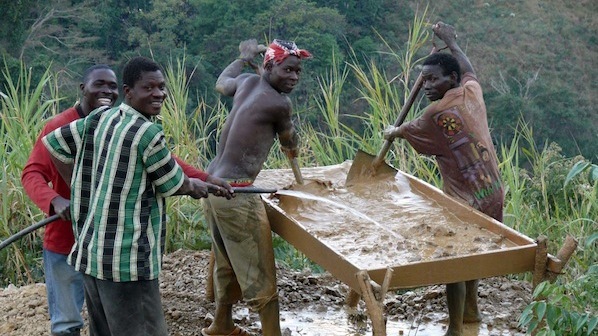 Artisanal small-scale miners are empowered to improve their livelihoods. Retailers and consumers are given assurances that the miners are fairly compensated for their efforts and that the environment around the mine is not contaminated with mercury or cyanide. Just like Fairtrade has changed how consumers view and buy coffee and chocolate, Fairtrade gold will one day alter how people view and buy jewelry. Our company in Santa Fe, New Mexico, is the first Fairtrade gold jeweler in the US and we offer an extensive line of Fairtrade gold wedding rings though our Valerio brand. By buying a Fairtrade gold wedding ring, you will be part of the global Fairtrade movement that reduces poverty and mercury pollution while empowering small-scale miners throughout the world. I was not aware that 14k rose gold wedding bands are 58.5% pure gold as you mentioned but I don't mind since my cousin is planning to buy that for his fiancee anyway. Since you mentioned that they are more hardwearing than 18k rings, there's a chance that it will last longer even if she wears it daily. I'll keep in mind to ask any jewelers if they have nickel components in their rose gold wedding bands so that she'll be safe even though you stated that it is extremely rare. Sariah, Even though 14K is more durable, many people wear 18K rings for a lifetime as well. If you have any additional questions or comments, feel free to contact us.